Howard W. Hewitt – The weekend football trip to Virginia and Washington D.C. was rewarding in several different ways. For anyone on the trip, it was hard not to take great pride in all of the comments we heard about our students. I was on the receiving end of one of those situations. As our plane prepared to land in D.C. Friday afternoon, the stewards and stewardesses were making their final trash pick up. I was unlucky enough to be in the very last row of seats but on the aisle. The steward leaned down to whisper something to me. “I just have to tell you these students are more polite than most of the people we have on this plane every day,” he said. We heard similar compliments throughout the weekend but Wabash men almost always conduct themselves in a manner which would make an alum or mother and father proud. We regularly cleaned the busses and any area that our 60-some college athletes passed through. Sometimes it’s left to faculty, staff and administrators to do the right thing. But it’s also not hard to suggest the students also inspire our actions by their thoughtfulness and kindness. 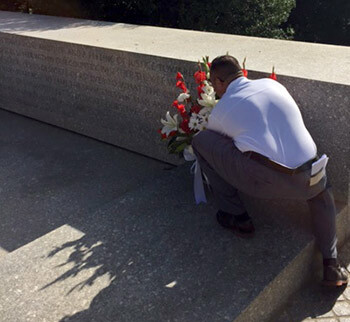 Coach Olmstead places the vase at the RFK quote at the JFK eternal flame. Dean of Students Michael Raters shared one such story after our return. The moving photos of the Tomb of the Unknown Soldier changing of the guard and our wreath laying ceremony tell a powerful story. But there was a mix-up prior to that ceremony which was just as meaningful. When Raters and assistant football coach Olmy Olmstead went to the Tomb with four players for instructions, they discovered a vase of flowers had been delivered instead of a wreath. The guards explained that just wouldn’t do. Fortunately, the guards keep a ‘back-up’ wreath on hand which the students used instead. So what happened to the vase of flowers? The following is Raters’ description of what happened next. “The guards then asked Olmy to take the other bouquet and place it somewhere else in the cemetery,” Raters wrote. “I joined Olmy as he retrieved the vase and we carried it to another place that had certainly captured the students’ interest – the Kennedy family plots. As we walked and talked about the exact site we should use, one spot seemed to make the most sense for us to represent our team, its heritage, and that of its members. 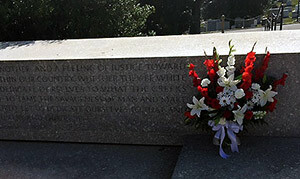 “So I ask you tonight to return home, to say a prayer for the family of Martin Luther King — yeah, it’s true — but more importantly to say a prayer for our own country, which all of us love — a prayer for understanding and that compassion of which I spoke.” – Robert F. Kennedy, April 4, 1968, speaking in Indianapolis and announcing the assassination of Martin Luther King.